Please fill out the Order Form Page(PDF document,WORD document) completely, print and send it to us. If you send us your used hair piece, we can make an exact copy of it and send it back with your new hair piece. - Our products are available to all international customers. - To make a template, please Click Here . - If further details are required, please do not hesitate to contact us. - We shall be pleased to send you any further information you may need. 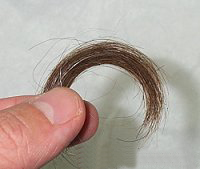 - You can choose a hair piece base sample, Click Here to see base samples. - We can make any designs that the expensive retailers use. - If you have any good ideas of base, please do not hesitate to let us know. that will be best for you. - We will use 100% finest human hair, gray hair is synthetic. - You can request 100% of one or the other or a mixture of both. - We need your hair samples, please send us your hair samples. - Take them from several areas of your head and label each one, telling us what part of the head it came from. - Tell us if you want highlights on any section of the head, because some people want it to look like they have been out in the sun a lot. - Please attach your hair samples on special orderform. - If your sides are more Grey Hair, clip a sample. we can analyze your hair density by your photos. - Medium heavy density is considered 120% thickness of an average head of hair. - Medium density is considered 100% thickness of an average head of hair. - Medium light density is considered 80% thickness of an average head of hair. - Light density is 60% thickness of an average head of hair. - When you enclose your hair sample we will analyze your natural wave pattern. - Average length on all hair pieces are 5-7 inches. we can offer from 6 inches to 30 inches.